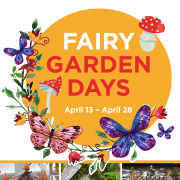 There are several ways you can volunteer during Fairy Garden Days April 13 th-28th. Volunteer shifts run daily from 10am-1pm and 1pm-4pm, even on Easter! Committing to 3+ shifts (honor system) will earn you a free invitation to our Preview Party Fundraiser on April 12 th. We could use up to 14 volunteers per day so we are hoping people will be willing to help. Check out the descriptions below. If you are interested in volunteering go http://signup.com/go/OyFcQHs to reserve your shifts or email criker@providenceri.gov with the dates and times you’d like to commit to. Greeter Fairies - Sit at the main entrance in the Conservatory - greet visitors, give directions if needed, and pass out scavenger hunt sheets. Crafting Fairies - Keep Fairy Wand Station (GH3) running smoothly - greet visitors, explain the steps to make a fairy wand, restock supplies, clean off tables, and put unused materials back into appropriate containers. Fluttering Fairies - Wander throughout the greenhouses and outside areas to make sure things are running smoothly - Watch over fairy houses, reset games, give directions if needed, and engage with visitors. We ask volunteers to donate their time in 2 hour or more shifts, as often as is possible.